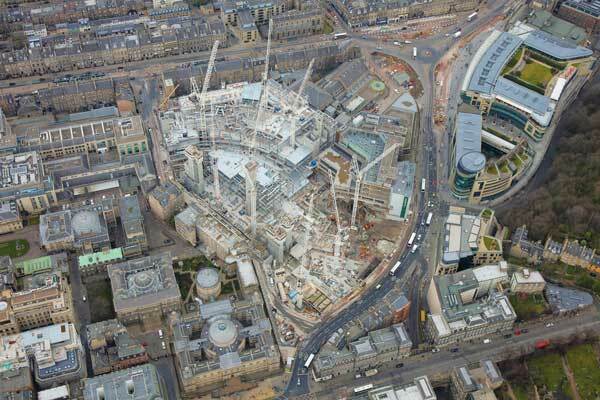 Numerous column grid patterns, requiring hundreds of tonnes of transfer structures, are helping to create a large retail-led mixed-use scheme in central Edinburgh. Steel tonnage: 15,000tOne of the most significant construction and regeneration projects currently under way in the UK, and the largest city centre development Edinburgh has seen for decades, is dramatically altering a large part of the Scottish capital. Known as Edinburgh St James, the £1bn project is replacing a 1960s shopping centre with 79,000m² of new retail space, anchored by an existing John Lewis store, a five-star W Hotel, an aparthotel, 152 prime residential apartments, more than 30 restaurants and the city’s first Everyman Cinema. The completed development will help Edinburgh climb the UK retail rankings from 13th to number eight, while potentially, the scheme could help the city’s tourism spend – it is the UK’s second most visited city after London – increase by 42%. Work on this large city centre scheme, which is close to Waverley railway station, began in late 2016, with an 18-month demolition phase of the existing buildings. 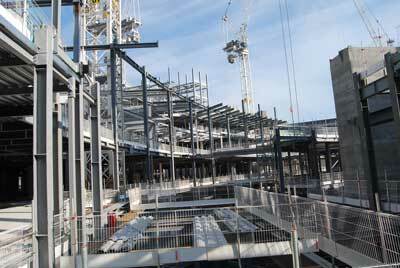 The John Lewis anchor store sits adjacent to the site and continues to remain open throughout the construction programme. It is being enlarged as part of the scheme, with a new steel-framed extension, while the main existing parts of store will be fully-integrated into the new retail offering. The store has provided one of the main challenges for the construction programme as part of its footprint covers the site’s basement car park. More than 380,000m³ of earth has been dug out to form the three-level car park that covers the entire site’s footprint. 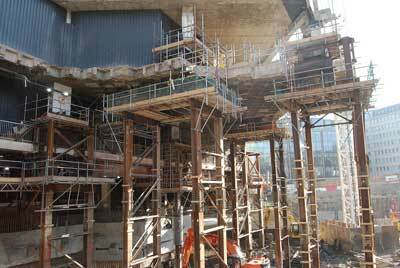 But in the area beneath John Lewis, a temporary works programme was undertaken prior to this part of the dig. Some of the store’s concrete columns had to be removed and the floorplates temporarily propped, so the subterranean levels could be excavated. A total of nine new steel replacement columns, measuring 12m in height and each weighing 10t, will be installed. This will involve a tricky jacking process to be undertaken, as the floorplates need to be temporarily supported on trestles, to allow the new steelwork to be installed. Once the new columns are installed the trestles will be removed, with jacks placed at each column location. Adding some more complexity to the scheme, the cinema block will be positioned above the main John Lewis store, supported on existing concrete columns that extend up to level five. Above these columns, a series of 3m-deep steel trusses will support the cinema and its own unique column grid pattern. The two lowest levels of car parking have been formed with in-situ concrete, but from there upwards the scheme, in its entirety, is using a steel-framed solution. The third level of car parking is formed with steel columns, which are founded directly on to concrete columns, and steel beams supporting metal decking and a concrete topping. 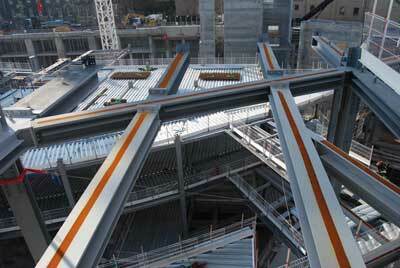 The majority of the project’s floors from this level upwards are formed compositely. Overall, the scheme is one large steel frame sub-divided up by movement joints, most of which are located either side of the 20 bridges that span the main semi-circular retail mall. Numerous concrete cores provide the steel elements with their stability. “A steel solution is an efficient design solution, as it requires a smaller and more manageable workforce than other methods,” says Laing O’Rourke Project Director Tim Kelly. The car parking floors are all based around an 8.5m × 7.5m column grid pattern, but above this the spacing changes to a retail grid of 8m × 8m. “Different grids have been used as each one is the optimum size for either car parking or multiple retail units that will be located over five levels,” explains Arup Associate David Ferguson. The retail grid is mostly the same throughout the scheme, but reduces in size slightly to suit the semi-circular shape of the mall and the irregular boundaries of the site. The change of column spacings between the parking and retail levels has necessitated a raft of transfer structures to be installed at level one. These are generally 970mm-deep × 800mm-wide plate girders. However, as BHC Project Manager Bobby McCormick explains, a more convenient option was also employed, wherever possible. 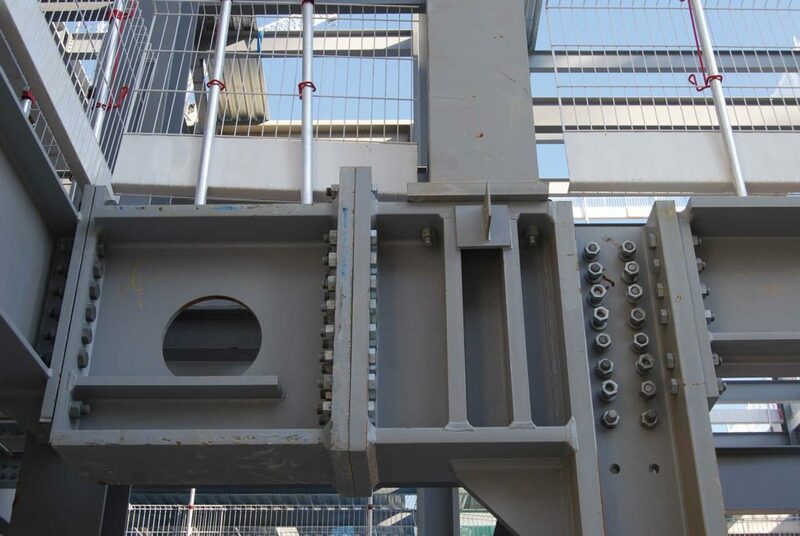 “We tried to swap as many plate girders as we could to off-the-shelf ArcelorMittal Histar sections, as they are cost-effective and require no fabrication. The plate girders are not the largest steel members on the site, these are a series of 1,450mm-deep × 1,020mm-wide × 25m-long beams, each weighing 38t that form the main service yard. Above the five levels of retail, the column pattern changes again to accommodate three floors of residential apartments. To allow the column spacing to decrease to a 5.5m × 3.3m grid pattern, transfer beams up to 840mm-deep are positioned on top of level five. Further separate grid patterns are required for the project’s two hotels. The Roomzzz aparthotel is positioned above one of the retail zones and will be constructed around a regular 6m × 6m rectangular spacing, however the main five-star W Hotel is a different proposition. To be erected around its own centrally-positioned concrete core, the W Hotel will be 13-storeys high and sits on a separate grillage of transfer beams positioned at level one. The building is an egg-shaped structure, formed with radial floor beams creating a column spacing which is 4.8m at its widest. Adding to its complex design, the lowest three floors are inclined with raking columns, while the upper three are set-back, forming large terraces. To create this complex-shaped structure, BHC will use a combination of facetted and curved steel members to form the balconies and perimeter walls. Twenty five years ago, designers were being encouraged to use S355 (known as Grade 50 then) rather than S275 (Grade 43). In a similar way today, the use of S460 offers benefits as demonstrated by its use in the Edinburgh St James project. The major structural advantage is seen in the design of compression members, where a higher column buckling curve is specified for S460. In the minor axis, which is generally critical, the buckling curve improves from curve ‘c’ to curve ‘a’ for a typical column section. There is a minor disadvantage because the non-dimensional slenderness increases with design strength, but this is more than offset by the improvement in buckling curve and the 30% increase in design strength. For typical column lengths in multi-storey buildings, the increase in resistance by using S460 can be in the order of 35 – 40% compared to S355. Smaller, lighter column sections can therefore be used. In bending, the increase in resistance is solely due to the increased strength, offset very slightly by the increased slenderness if the member is unrestrained. 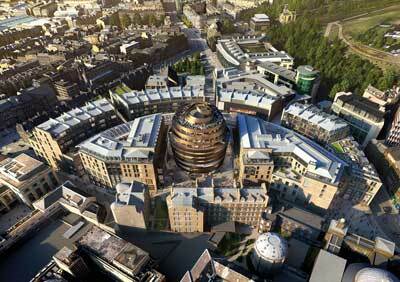 The Edinburgh St James project used S460 HISTAR. This steel is not covered by BS EN 10025, but by a European Technical Assessment (ETA), number 10/0156. The ETA can be found on the EOTA website by searching for the ETA number. An ETA is an alternative to a harmonised Standard, and in this case tabulates the same mechanical, chemical and toughness properties as BS EN 10025, but specifically for HISTAR steel. The special feature of HISTAR steel is that the design strength for S460 does not reduce until the thickness is greater than 100 mm. There are no reductions at 16, 20, 63, 80 mm that would normally be anticipated – the design strength to be used in calculation is 460 N/mm² until the thickness exceeds 100 mm. Above 100 mm, the design strength drops slightly to 450 N/mm². For relatively thick sections, the use of HISTAR would lead to an increase in resistance of around 15%, simply because there is no reduction in the design strength. Designers should not be concerned about welding S460. The key measure of weldability is the carbon equivalent value (CEV). Table 4 of BS EN 10025-4 shows that the CEV for S355 up to 120 mm is 0.45, and for S460 is 0.48 (so not a significant increase). From Table 5 of ETA 10/0156, S460 HISTAR has a maximum CEV of 0.43 indicating that welding should not be more difficult with the higher grade.